Yesterday we had a home game and one of the coaches wives put together a tailgate, it was a good time! I wanted to bring something and had some leftover crescent rolls from the apple dumplings I made this week and wanted to use them up. I was originally thinking of just filling them with some chocolate hazelnut spread and calling it a day. But, when I heard there would be chili I wanted to make something that would go good along side. Plus, I was already bringing some store-bought cookies. 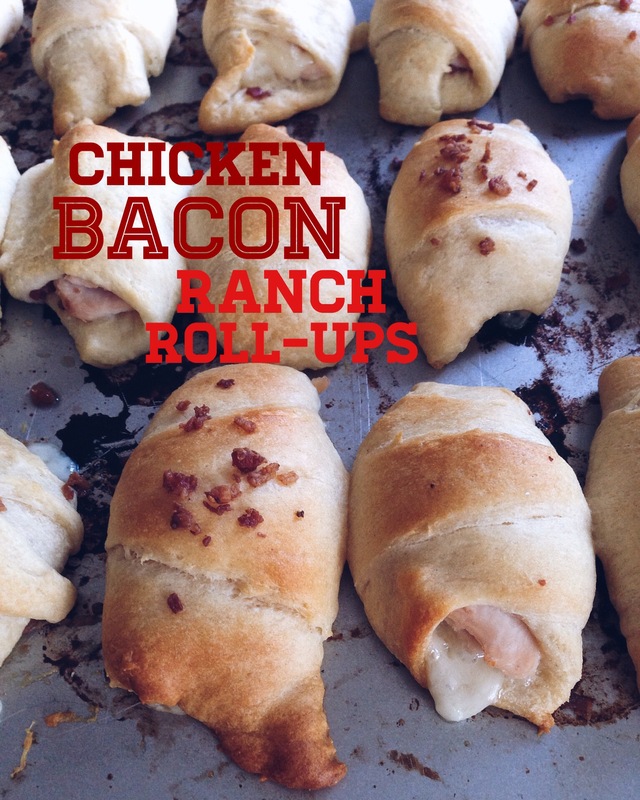 These roll ups are really simple and I used all store-bought, pre-made ingredients. Did I say these were easy yet? Lay them out, brush on some ranch dressing. I used buttermilk ranch dressing I had leftover from the week, but bottled would be great too and even more simple. Fill ’em up! I bought some chicken sandwich meat, but you could use leftover chicken or rotisserie chicken. You could also use freshly cooked bacon, chopped up, but I went the easy route with some good old bacon bits. 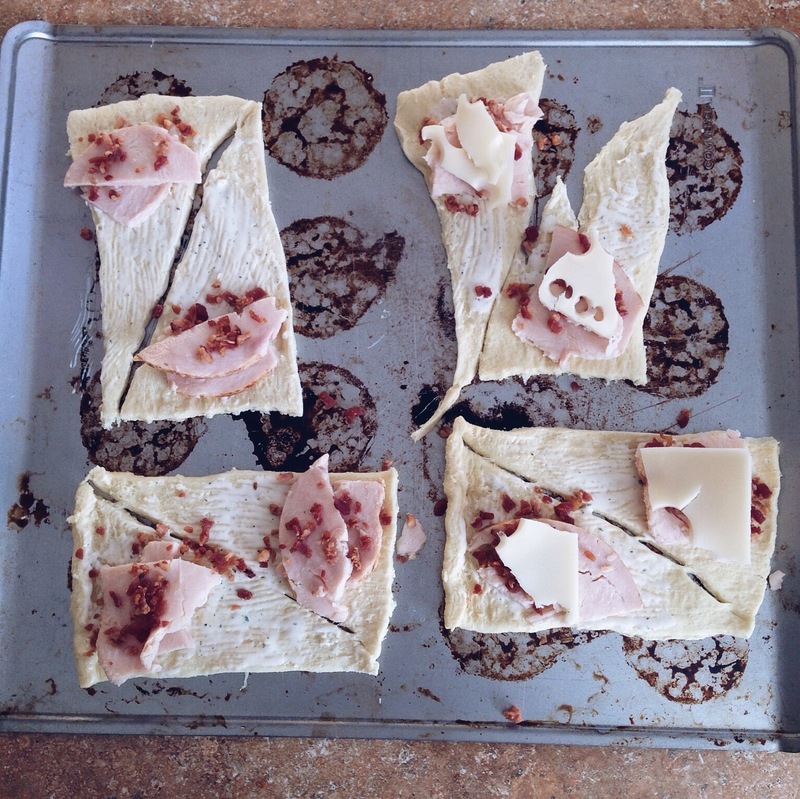 I tore pieces off of the chicken and cheese, you don’t want them to be too full so they can’t roll up. Roll ’em up! Top some with a little bacon. 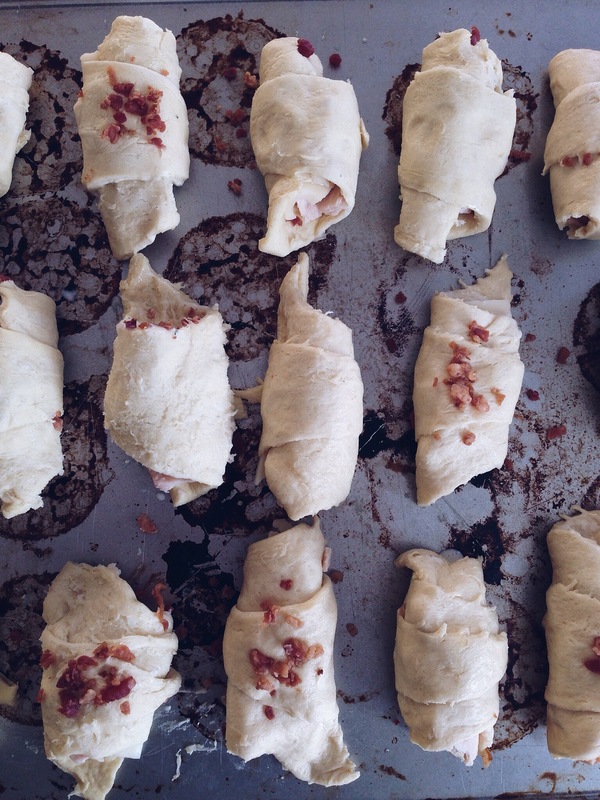 Bake them up. So melty! 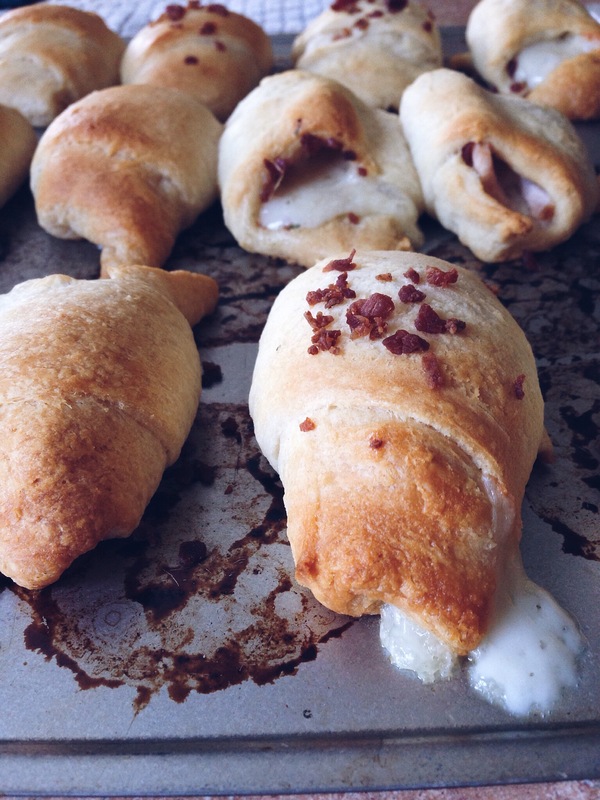 Roll out the crescent roll dough. Lightly brush on some ranch dressing. Top with a small piece of chicken and Swiss cheese. Then sprinkle with bacon. Roll them up starting at the wide end. 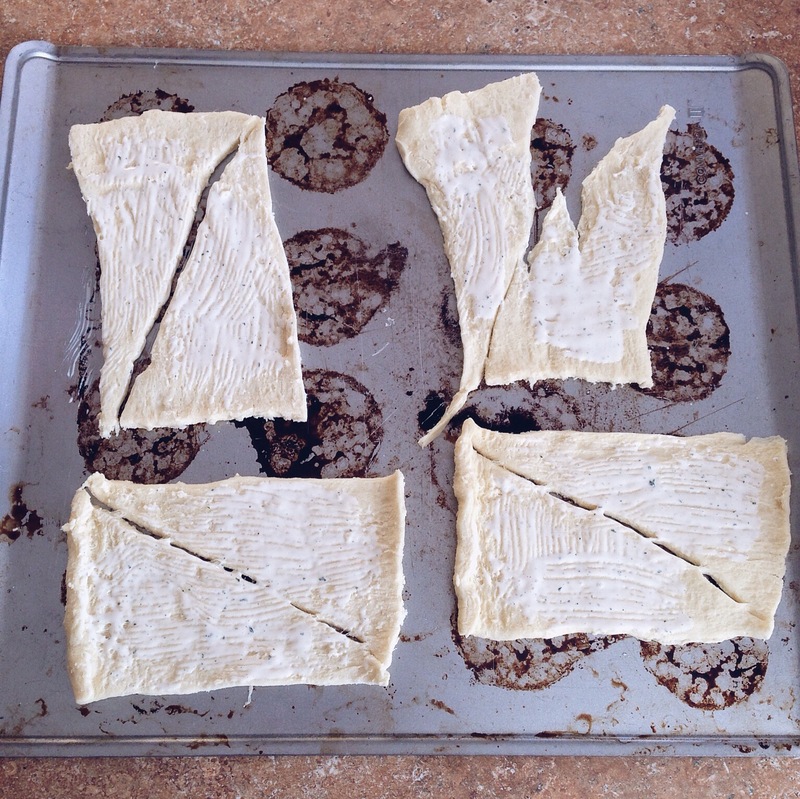 Place on a baking sheet, seam side down, and bake for about 10-15 minutes or until they are golden brown and the cheese is oozing out. These are great for tailgating, watching football on a Sunday afternoon or as a quick appetizer.